You can play split-screen co-op on the console versions of Resident Evil: Revelations 2 but not the PC version. It's not uncommon for games to have different features on other platforms, here's the problem: Capcom didn't appear to tell anyone until the game was about to launch. In Revelations 2, players are always running around with another character. It's possible to swap between 'em by pressing a button, but playing co-op to watch a friend's back sounds cool. For the story mode, there is no online co-op in ANY version of the game. It's offline only. As a Steam user points out with a screen capture, however, Capcom appears to have secretly added a note about the game not having offline co-op without really telling people about it. That's not cool. People pre-ordered Revelations 2 thinking it would have offline co-op. It doesn't. This is how the Steam page reads right now! Capcom still hasn't managed to fix it. VG247 was able to get a short but ultimately unsatisfying statement from Capcom about it. "The decision to prioritize a single local screen was made to ensure a stable user experience across a variety of different PC settings and devices. 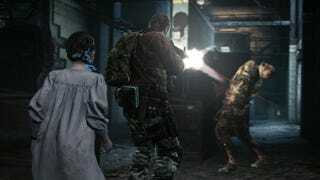 Raid mode will support online co-op shortly after launch when a free patch is available for players to download which adds this feature, but the main campaign on PC will only be available to play in single local screen." It's one thing for the game to drop a feature, it's quite another to be disingenuous about it. At the same time, as I wrote in my impressions of the first episode yesterday, it might not even be worth checking out Revelations 2 until we find out if the rest of the season starts to improve.